Variable Wizard brings communication between Triggers and Actions in Automation Workshop. It is a key feature that allows to create Tasks that use context-specific dynamic values instead of fixed parameters. Many Action parameter inputs allow to use Variable Wizard values which are typically retrieved from preceding Action or Trigger. Using dynamic values is instrumental in creating context-sensitive Tasks whose behavior depends on what is actually happening within the system instead of rigidly performing fixed operations. Applications of dynamic values are numerous and you will find yourself connecting Triggers and Actions more often than not. The strength of automation lies in ability of different modules to communicate between each other. For example, if File / Folder Watcher monitors a folder for new files and launches Send Email Action to attach them, then it needs to tell Send Email Action the name of newly detected file. Variable Wizard allows telling Send Email Action to take the file name from File / Folder Watcher, thus allowing both modules to work together. 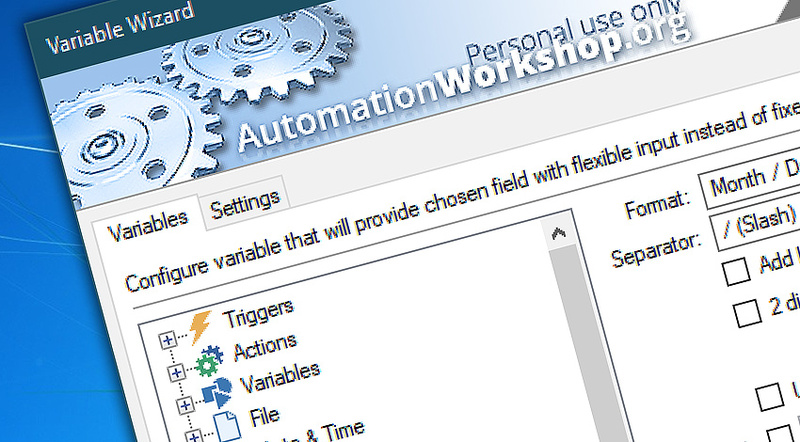 Variable Wizard is instrumental to communication between different modules of Automation Workshop. Allows configuring Actions to flexibly respond to specific situations. Connects Triggers and Actions in a workflow. Retains essential parameters from each performed Trigger and Action. Returns dynamic values from Triggers and Actions supported by many parameter inputs. Multible formats for many variables for use with different Actions. Variable Wizard · on connecting Triggers and Actions effectively. Variable Wizard & email IP · how to email dynamic IP address automatically.